GBP/USD is getting more comfortable on higher ground as the drama around Brexit is not as intense as it used to be. The Technical Confluences Indicator shows that cable faces initial resistance at around 1.2652 which is the convergence of yesterday’s high, the Pivot Point one-day Resistance 1, and the Fibonacci 61.8% one-week. 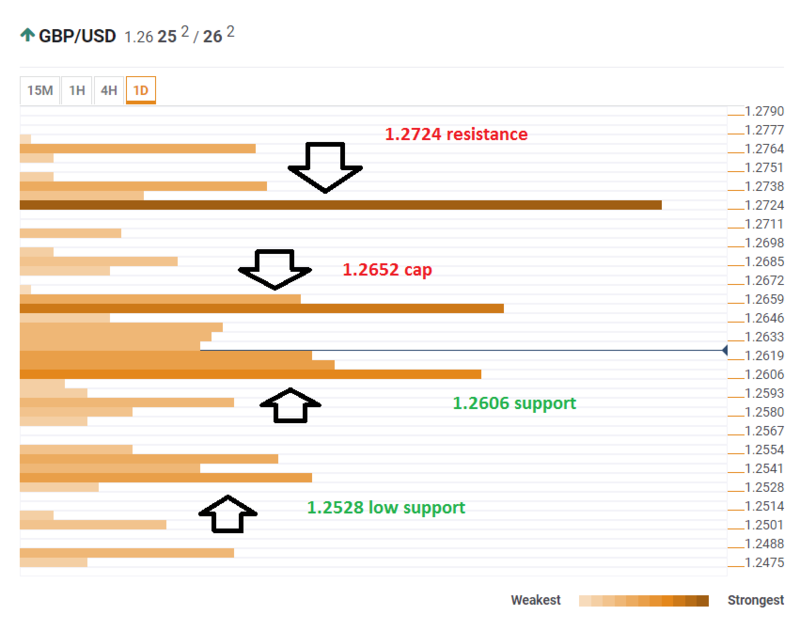 If that level is overcome, the next level to watch is already significant resistance. At 1.2724 we find a cluster of potent caps. It includes the PP one-day R3, the Bollinger Band one-day Middle, and last month’s low. Looking down, support awaits at 1.2606 where we see the confluence of the Fibonacci 61.8%, the Simple Moving Average 10-4h, the SMA 5-one-day, and the SMA 100-1h. The next support line is 1.2528 where we see the Fibonacci 161.8% one-day, the BB one-day Lower, the PP one-day S2, and the Fibonacci 23.6% one-week.